Anubhav Sinha's Gulaab Gang doesn't just mark Madhuri Dixit's big screen comeback after Aaja Nachle, it also brings her and Juhi Chawla together on screen for the first time ever. A seemingly excited Madhuri shared the first look (above) of the film with her followers on Twitter recently. Based on the inspiring life of women's rights activist Sampat Pal Devi and her Gulaabi Gang, the film required some stunts that Madhuri worked really hard to pull off. Please click NEXT to see the actress in training! The actress is photographed here performing a rather volatile stunt during the film's shooting. Produced under Sinha's newly formed production company Benaras Media Works, Gulaab Gang is directed by Saumik Sen. Reportedly keen getting her action scenes right, Madhuri will be seen in an angry, aggressive avatar on screen, a departure from the roles she's essayed in her prolific career. 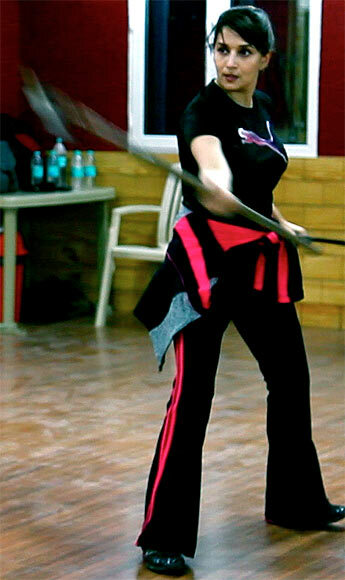 The actress's trainer helps her with a rustic weapon. The actress has reportedly also trained extensively under well known Shaolin master Shifu Kanishka Sharma for the role. Producer Anubhav Sinha poses along side his leading lady. Readers' Pick: Top 10 Groundbreaking Hindi Films!